This reveals a current maximum extent for 2017 of 14.302 million square kilometers on February 20th. 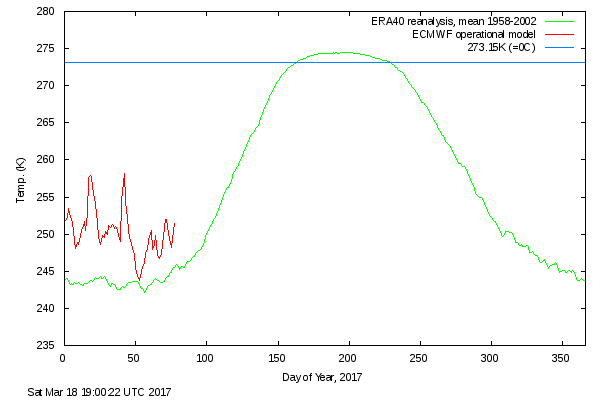 With each day that passes the highs of February 19th/20th look more likely to have been this years maximum. Nonetheless past experience suggests it’s still far to soon to be sure about that. However the 2013/14 winter showed a late surge is still possible. Subject to an unanticipated “surge” the 2017 maximum of 14.447 million square kilometers occurred on March 5th. The 2017 JAXA maximum of 13.878 million square kilometers occurred on March 6th. 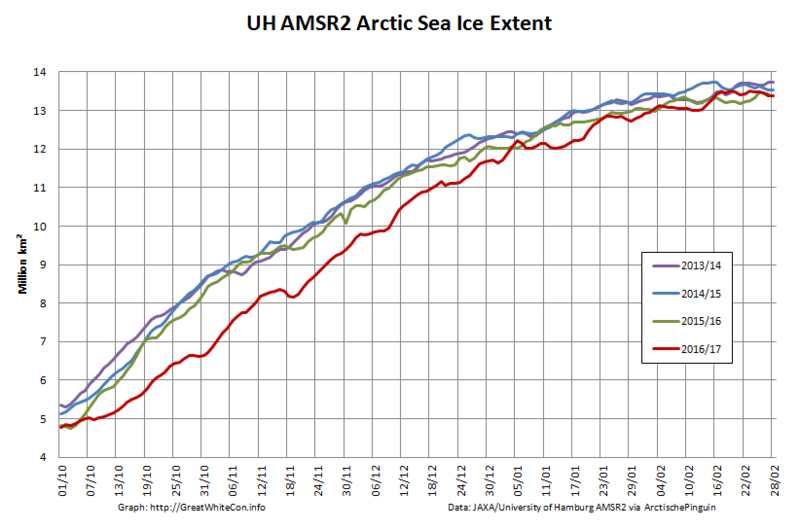 The maximum for that particular metric was 13.03 million square kilometers on March 3rd. Jim, I was trying to explain what’s going on- or indeed see evidence of all this being reflected in other indicators- by looking into moulins on Greenland. The moulins are all on/near the coast when you look at google maps so therefore I shouldn’t be worried about the moulins at all as they are relatively small fry: is that right? 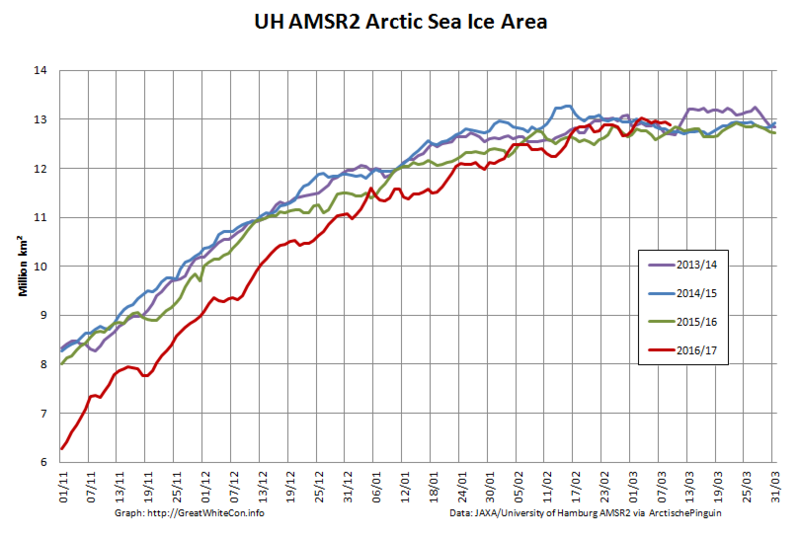 Also a near step change seems to happen in those top two graphs around mid-November… is mid-November itself changing in the Arctic or is that the normal timetable of events? Are you sure that what you refer to as “moulins” aren’t simply areas of surface melt? 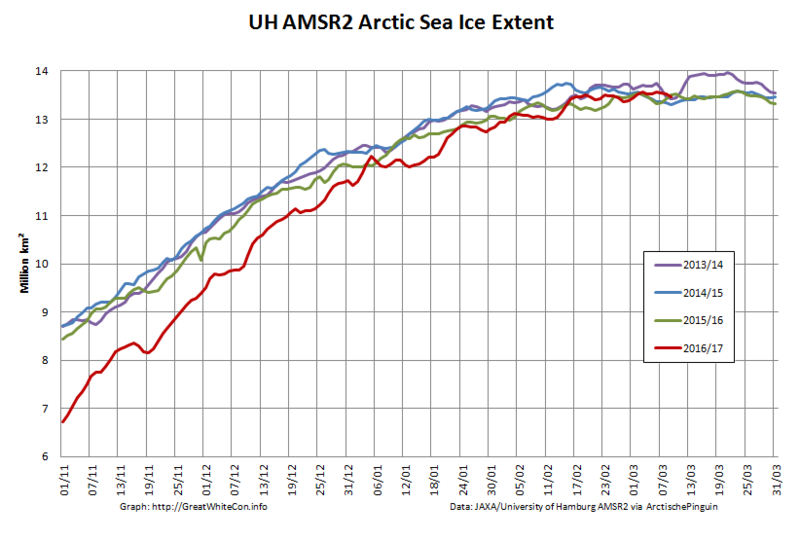 The mid November “hiatus” then “spurt” in area/extent is merely this year’s “weather”. I don’t think you can attribute any more significance to it than that. Ok, I know nothing about moulins…I’ll get back to that subject one day. Check it out especially around 25:20 . It’s to do with lakes and, well… I’ll just let you interpret it! I know you like lakes!! 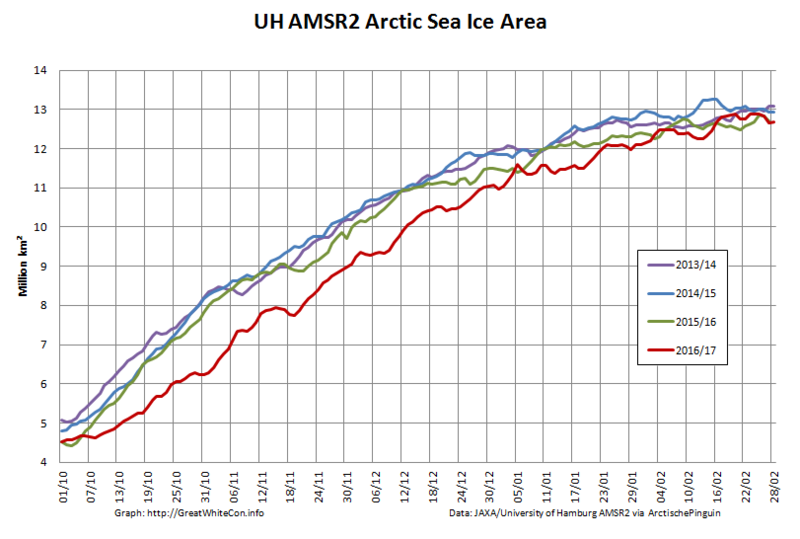 By any measure that’s an abrupt climate change. In less than a human lifetime Arctic sea ice has shrunk tremendously. Shrunk noticeably. Shrunk significantly. You pick your adjective. Cool, I am watching this space. 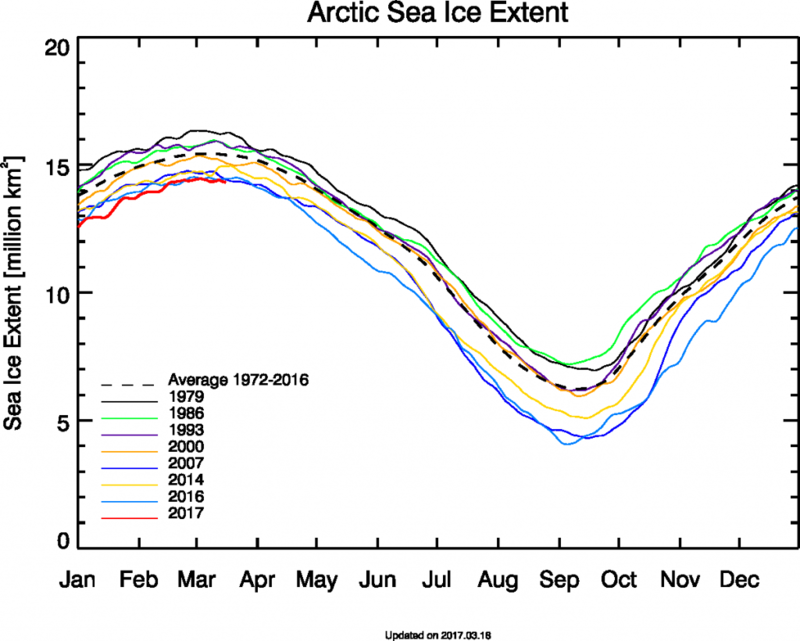 And we must keep in mind that, despite all of the very thick ice in the Beaufort last year, it melted out completely. This melt season will be riveting. This poster from ASIF says that 2016 WAS (as in, factually!) 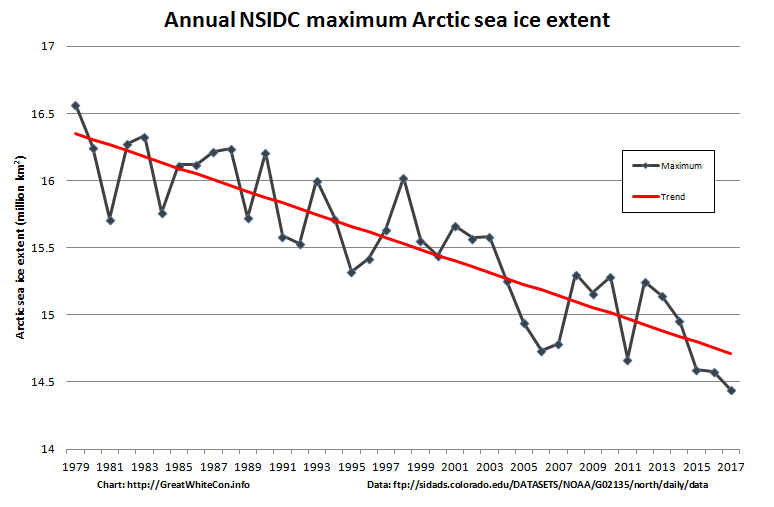 bad for the multi year sea ice in the arctic. 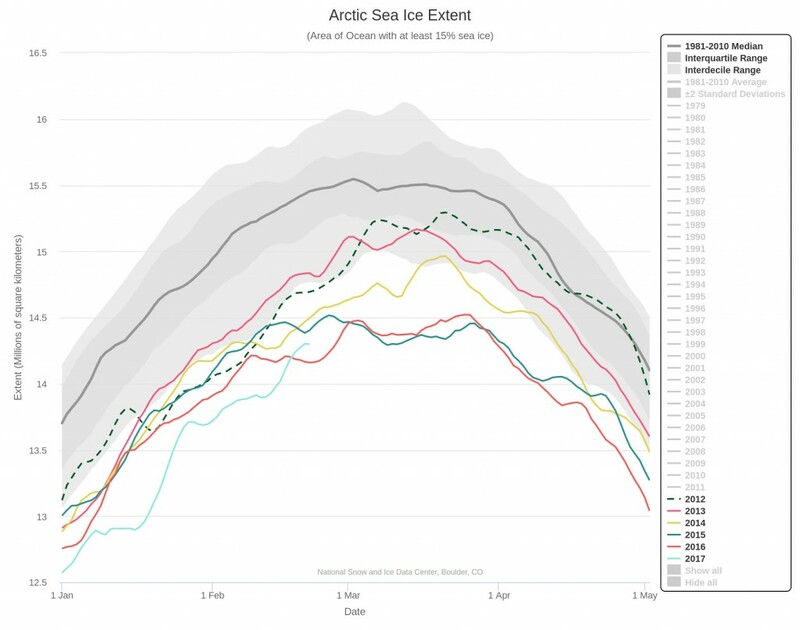 If my Dad told me in Jan/Feb last year that this year (2016) could be the end of the multi year sea ice in the arctic- because that was obviously the subject of our conversation for the previous, ya know, coupl'a' years: HOW DID HE KNOW THAT? Hello Jim, I think you’re right. 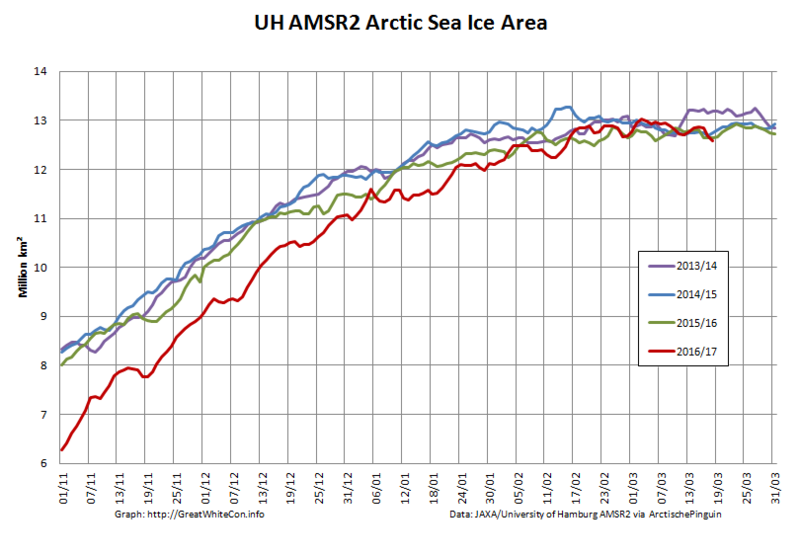 I posted my blog on the new arctic SIE record low maximum today (March 18). I’ve been checking against the JAXA Vishop page, and at this point over 75% of the SIE maximums for previous years have already passed, but the real clincher was that as of (actually 15/3) there has been no year in the past 17 years where the SIE has risen from this date by more than the SIE for 2017 has fallen since its maximum on 06/03. 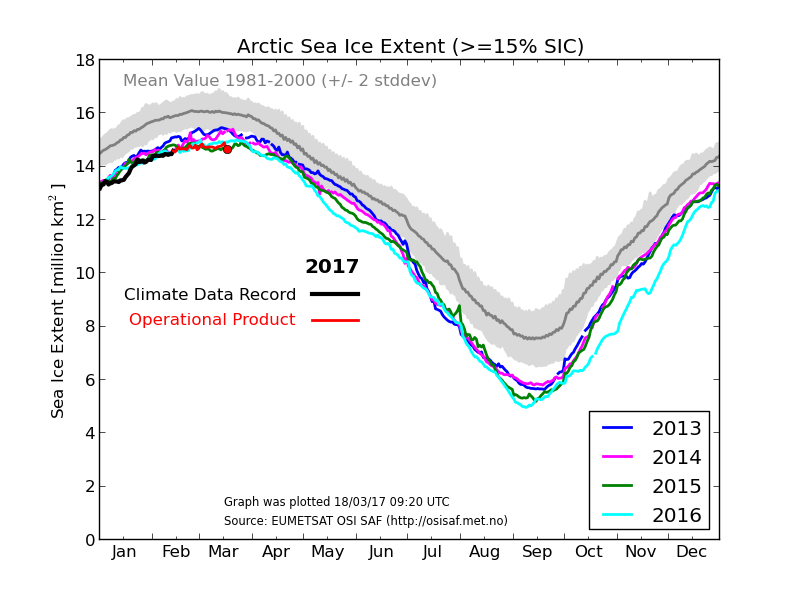 For the figures up to 16/03, the 2017 fall from its maximum is around twice that of the maximum rise in every previous year since 2000 from 16/03. Therefore the maximum can be called. Your analysis parallels my own. JAXA extent dropped another ~50k or so this morning. I clicked through to your site and I’m intrigued. Apart from programming mainframes in FORTRAN I learnt my craft using Z80 assembler on a Nascom 1! I thought I’d add the current state of play of DMI extent too, but they seem to be working on their site this weekend? 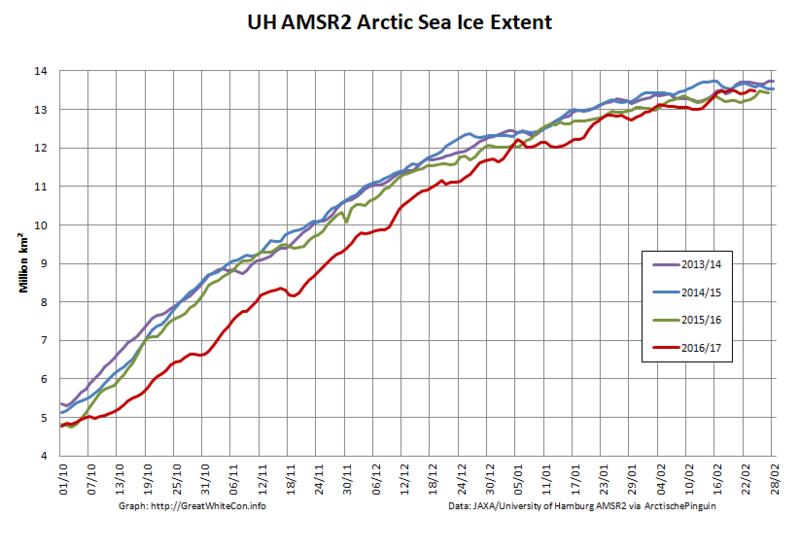 We’ll need to wait a while for the red “operational” line to turn black, but it looks as though DMI (or OSI-SAF in actual fact) has posted a much later maximum than the other metrics we’ve looked at so far. 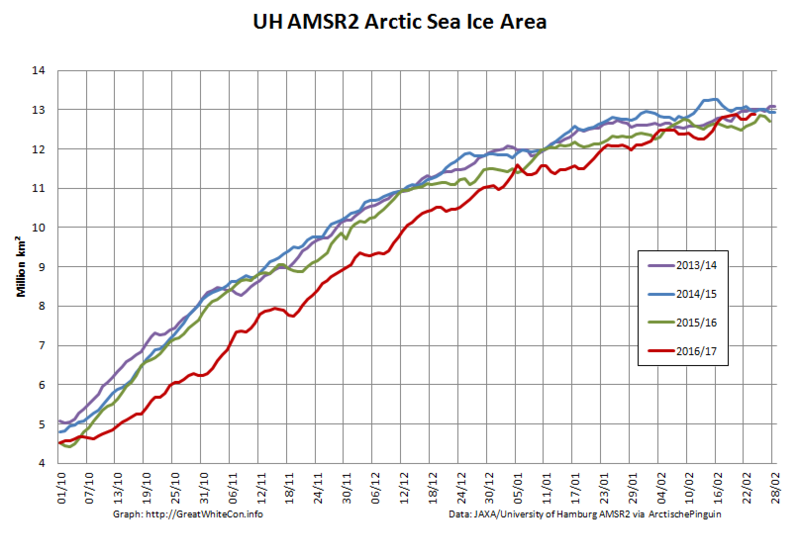 Arctic sea ice was at a record low maximum extent for the third straight year, according to scientists at the National Snow and Ice Data Center (NSIDC) and NASA. 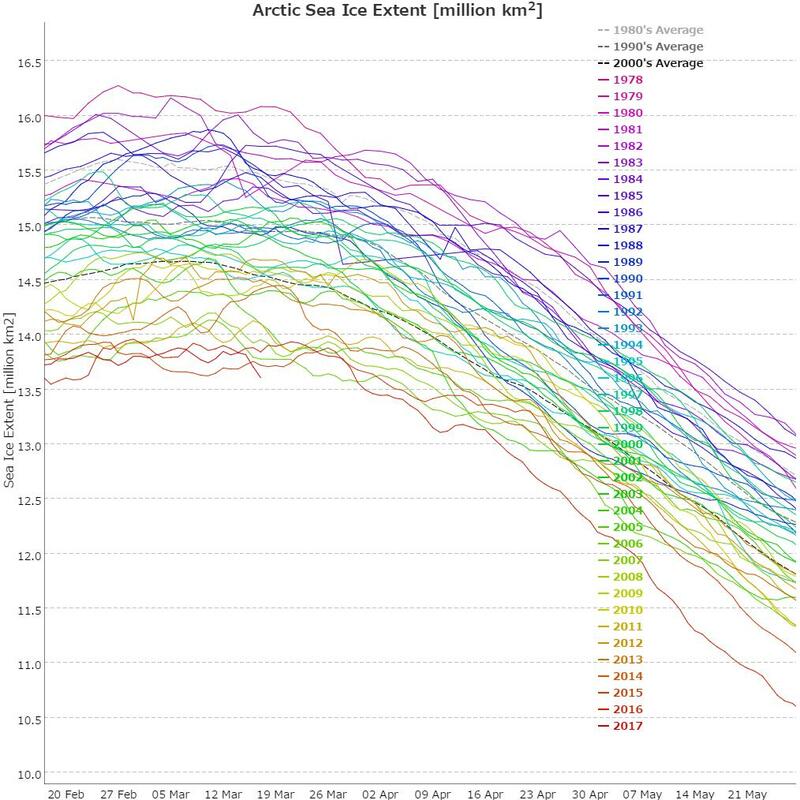 On March 7, sea ice extent over the Arctic Ocean reached 14.42 million square kilometers (5.57 million square miles), then gradually began its decline with the start of the melt season.